Well, it’s certainly been a while since I last posted, (as many of you have reminded me!) but it’s largely due to being so busy designing and implementing lots of new gardens last year, added to the fact that it takes me such a long time to write and post these blogs- technology not being my strongest skill. So, I’ve decided to do occasional blogs this year, mainly to chart the new gardens that I’m designing, as well as my garden visits to other people’s gorgeousness. I’ll start with a garden implemented a few months ago. It was a new build in a gated development , bought off plan, as many of them are. The trouble is that it’s often difficult for clients to visualize how their new home’s setting will look after all the surrounding houses have been built and what effect they will have on their outlook and privacy. So, what was a leafy open aspect on that first site visit can often turn into a congested, privacy nightmare by moving in day. So what to do? Well, first of all, address those stark boundaries by painting the fencing a smart black which provides a contemporary background that makes any planting in front of it POP! Then, nothing personal… blot out the neighbours! It’s got to be evergreen and tall, so we’re talking pleached evergreen trees like Eleagnus ebbengei or Quercus ilex …. That looks better now, doesn’t it? You can’t see those neighbouring houses any more – gone is that sinking feeling of living in a goldfish bowl….I always say you should be able to go outside in your oldest greyest dressing gown and a glass of wine and be certain no-one can see you! Job done. To give that sharp contemporary look I’ve started using pale porcelain as my preferred stone. It’s got a rough surface so is anti-slip, is made of pressed clay and is therefore very ecologically sustainable, is really easy to look after ( a water power wash), and looks brilliant in any modern setting. I like to use large sized stones to give a luxurious look- these are 120cm x 60cm. The builders say they wish I’d use smaller ones, as lifting them is hernia territory! With white rendered walls and a stainless steel Cascade water feature, there is interest and division to break up the space and give a reason to visit its further reaches. 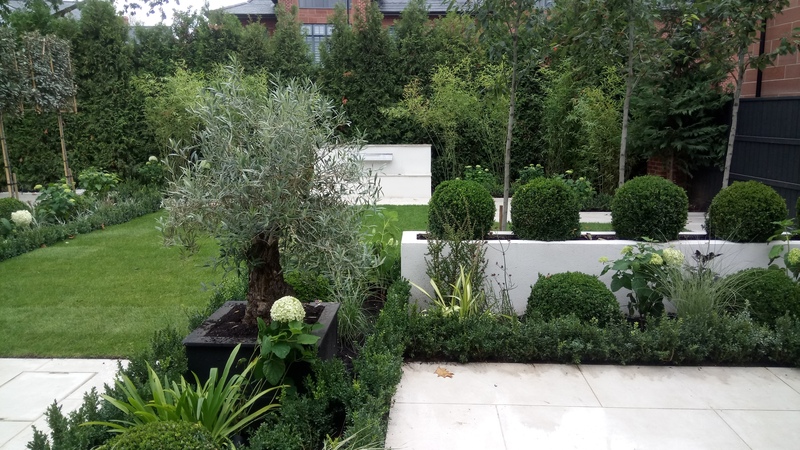 Planting is low maintenance and 75% evergreen to maintain that green furnished appearance in even the bleakest months. A lovely gnarled olive tree is a focal point from the windows and a soft limited colour palette of creams, whites and greens adds to the calmness of this space. The clients are delighted with it , and so am I!. Thank you, Anne. Great to see your inspirational work again. Gorgeous garden. Really appreciate being included in your blog. Looking forward to future posts. Glad you liked it Anne! Wow, I love it! That palette is just gorgeous, I love your new stone. Such an amazing transformation. The plants you have used look so healthy and vigorous. Well done, Anne!! Lovely to drool over your blogs again, welcome back! Welcome back Anne, I’ve really missed your blogs as I find them so helpful as I’m designing my own garden. Love you latest garden. Welcome back! Lovely to see you haven’t lost your magical touch – beautiful! Thanks Janet- nice to be blogging again! I am so delighted to see you back Anne! Ah, and the contemporary garden you designed is simply amazing! Why , thank you Natalia ! Lovely to see you back and a beautiful garden. Best wishes. Glad you like it Robert! Anne – It’s a gorgeous garden! Thanks Sue- it was a pleasure to design. Glad to see your work again Anne!! Thanks Bridget- I’ll make it to see your garden one day hopefully.